﻿ How to improve Customer Retention using Enterprise Search Solutions? How to Improve Customer Retention using Enterprise Search? No business wants to lose their customers, but more than 95% of customers leave or take action after a bad experience with a business, according to Zendesk. Well, you cannot always retain and win over every customer that comes to your business. However, with well-planned strategies, you can make sure most of the customers that are one time buyers will get converted into loyal customers. Now the question is – how to plan those retention strategies? This is exactly what we are going to discuss as part of this post. 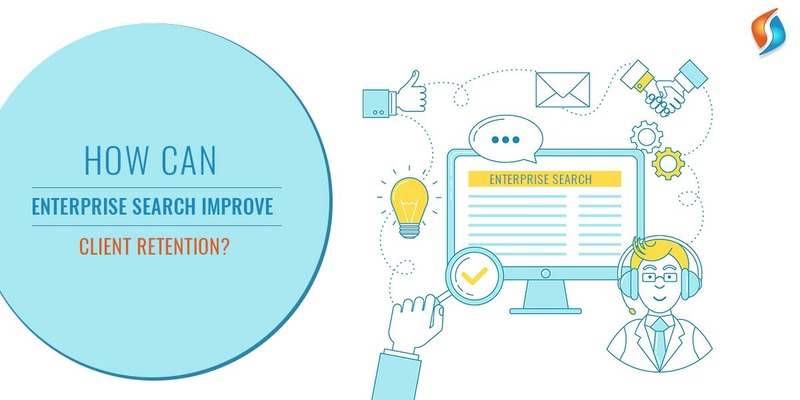 And how can enterprise search solutions meet customer retention? Let’s learn about it! In simple words, Enterprise Search is the organized retrieval of stored data within an organization that the users can securely enter and find specific data across the enterprise database. Enterprise Search software cleans and structures data to make information, that is spread across a variety of repositories easier to find. Every employee can benefit from this software solution. Since all employees need to look for data from a mixed bag of databases and shared sources to accomplish these daily tasks. Enterprise search technology has several sub-systems. At the time of search process, a crawler crawls the directories and websites. Next, it retrieves the data from the database and other repositories and structures the data. It additionally notifies the search engine that new information is available. Then a searchable index is created, metadata extraction and auto-summarization take place. Next, the information is grouped into logical categories that can be searched and return results to users based on how a particular search engine has grouped the data. Once the index is created for the information, queries can be accepted. Also, the database is categorized into five sections. And the first three steps are completed before any search is actually made. Content awareness- the search has to know which database can be accessed. Processing – the data needs to be processed so that you can recall it quickly and efficiently. The source data is converted to the same type of document so that it can be quickly searched by the search solution. Indexing – the processed data is sorted into an index, which keeps the track of the frequency of a specific term. Query – a user makes a search or a query. The query is a combination of what the user is looking for as well as directions to certain parts of the index. Matching – the search compares the query to the index and retrieves any matching entries. A request is made to the enterprise search engine to look for a specific term that has been asked by the user. And then the engine returns with the results that relate to the term based on the optimizing and tuning criteria. Google has shown us that investing in search has a positive impact on customer retention and the bottom line. Google has taught people how to search and what to await from a search engine. The very first step is to create a user-friendly search function on your website. But then you must maintain the master data, relevant models, business rules, and zero-results hits to ensure that customer experience is aligned. Also, note the phrases and keywords that your users insert in the search tab. This is useful business intelligence about your visitors and also indicates what type of information you should highlight on your website. Achieving great results on your website requires more than just right technology and responsive website. Rather, it is an ongoing process that successfully manages and has a huge impact on customer experience. Thus, creating positive results on your bottom line. While searching data within a business, features are available to those within the organization or anyone who has the access to the website. This includes owners, employees, and people at varying professional levels. Even though these employees have access to the search features, it is feasible to limit the level of access each individual has. With this, different employees can tack different files according to what is permissible to them or is within their security clearance. There can be varying security clearance levels developed for big businesses where there are greater levels of employee access. For the leaders who want to enable the enterprise search implementation, but do not want to give access to everyone within the company access to all available files within the database, this can be an option. Below points depicts how enterprise search solutions can help in customer retention. Who doesn’t like getting appreciated? Well, we all do. One of the first things that you can do in order to boost customer retention using enterprise search consulting software is to reward them in an unexpected manner. For instance, you can start by creating a customer life-cycle and setting up milestones in that life-cycle. Whenever a customer passes a certain milestone shower them with some reward. This simple step can show the customer how much you value their loyalty. Hence. they will not look towards a move to any of your competitors. Researches show that customers feel brands are not putting as much effort as they need to into providing efficient customer service. This is one of the major reasons that they look to switch brands. If you are also one such business, then one of the first steps to let the customers know – “You are there for them”, by making your presence felt across the platforms. This could be any forum, a social media channel or an online community. Using the right set of digital marketing services you can make sure that the customer gets heard, and this will easily help you win their loyalty. One of the time-tested strategies that have always worked to win the customers is the time-limited promotions. While many businesses look at this as just a means to boost the conversion rate. But the numbers show that this gimmick works quite well to keep the customers coming back for more. If a customer gets a good deal or a discount once, he or she will definitely return to check out for the same before making their next purchase. This is human psychology. Therefore, if you are able to understand this psychology you can eventually create campaigns using managed search solutions that can help you keep the maximum number of customers coming back to your business. It is quite common for businesses to agree with everything that the customer says in order to retain them. However, they seldom realize that in this process, they end up making false promises and fake claims. If you are doing this too, then it is time to part ways with it. Over-promising can put your business in a bad light when you fail to deliver on what you promised. Instead, big data analytics has shown it is always a wise choice to promise what you can deliver and stay true to your customers. After all, loyalty is built on trust and in order to win that trust, you must fulfill what you promised to your customer. Community building has become a staple in the marketing field. A business that fails to build a community can only dream of succeeding at whatever they are doing. Another aspect of community building, other than marketing your product, is that it helps you build customer loyalty. A brand with a huge following on the web is surely going to entice the customer. It can serve as social proof. So, you need to take action towards building a community, and this could work as your biggest asset to increase customer retention. As you can see, customer retention using enterprise search implementation does not require any rocket science. All you need to do is to understand some basic of customer psychology. Then the things can work out pretty well for your business. Get the best Enterprise Search Solutions! Most of the organizations now consider Enterprise Search as a strategy and a long term vision, rather than a single application. If you are still unsure of how to boost your business customer retention, the only thing you can do is to get in touch with our experts here at Signity Solutions, a renowned enterprise search vendor in India. Hire our outsourcing team of expert developers who assures that you will no longer have to worry about the things mentioned above. We have years of experience in providing the ideal enterprise search solutions to our clients. We not only focus on simple search but, also combines information analysis and document management with AI and semantic search. Drop us an email at info@signitysolutions.com, and we will get back to you.